At Home on the Hill Tales of freelancing, gardening, and other adventures in DC. About a month ago my hubby spent one cold, gloomy Saturday in the kitchen. The result? Amazing French onion soup (which he has made before) and, for the first time, bacon jam. It may sound odd, but it was heavenly! While he was furloughed I tried to convince him that writing a guest post about this incredible snack would be a good idea. Well, he may have gone back to work, but we are just getting around to sharing the bacon jam story. If you’ve read almost any of my wife’s blog posts, you are probably well aware of her adoration of anything pork. 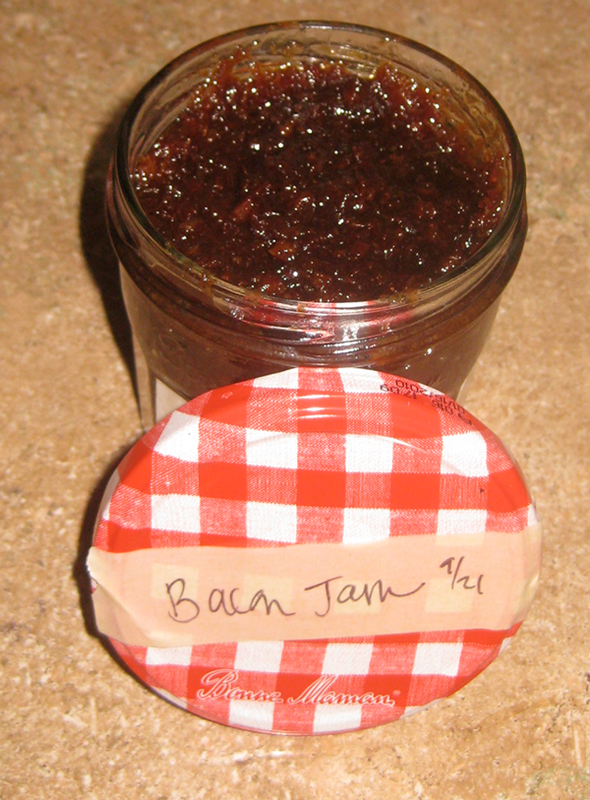 So when I came across a recipe for Bacon Jam on Foodie with Family, it was pretty much inevitable that we try it out. Just looking over the ingredient list had me drooling: BACON, onions, garlic, maple syrup, brown sugar… It was an easy, but lengthy, process—much like making French Onion Soup—where you slowly caramelize the ingredients and reduce them down to a thick viscous goo of goodness. 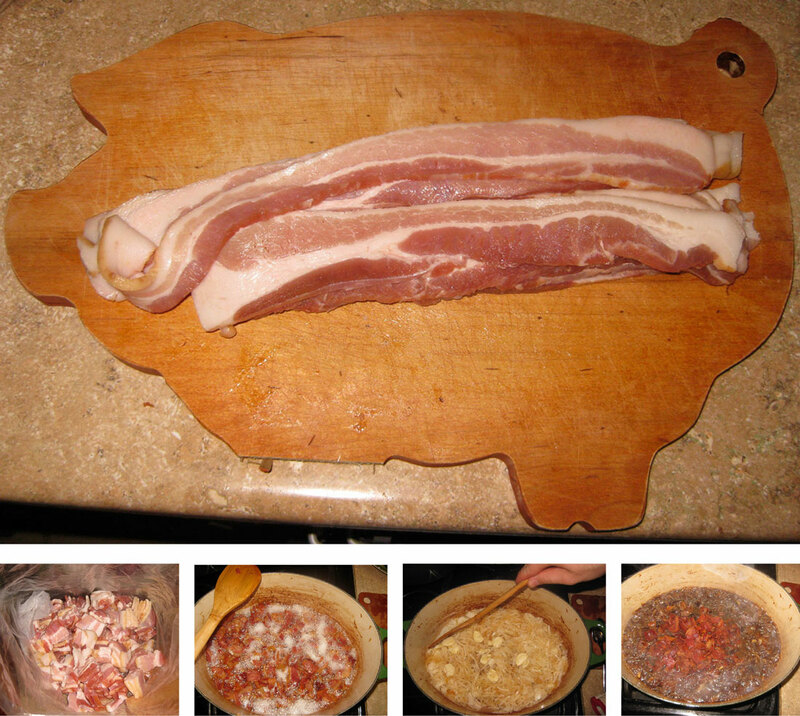 The many stages of bacon jam. And what do you do with this concoction with its beckoning bacon aroma? Through a thorough, uncompromising, and rigorous study, we determined it goes with pretty much anything. First of all, during the production phase, we tasted it off a spoon. That was good. The obvious first choice of bacon jam-to-mouth delivery vehicle was bread. That was good—whether on toasted baguette, whole wheat, Boudin sourdough, or my personal favorite home-made piping hot brioche. Subsequently we tried mixing it into granola. That was good. On top of a tomato slice. That was good. Woven crackers, water crackers, graham crackers. All good. Well, you get the picture. Three pounds of bacon later, I have a solid lead on where that weight went (I’m looking at you, love handles). But I wouldn’t take back a single delicious bite of that bacon jam. If you want to try your hand at creating your own bacon jam, or find yourself drooling over a variety of other delicious recipes, visit: Foodie with Family. Well it was raining all day! I will make this for my next wine and cheese party! AMAZING! Thanks! Acceptable to eat with a spoon.